Hunting is a challenge at the best of times. 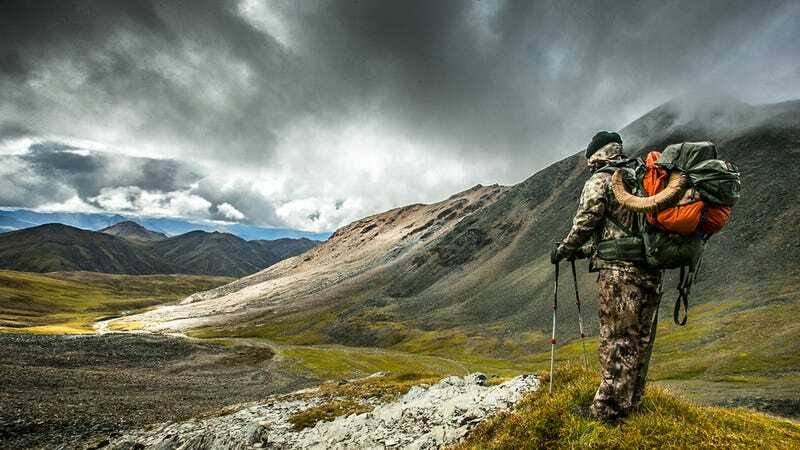 But, factor in America's most remote mountain range combined with this continent's most elusive big game species — the dall sheep — and you have a recipe for the most difficult 10 days of your life. Or, the most rewarding. I've always thought that beginning a hunting trip in an airport was strange. They are not an environment that exudes serenity or peace. Unfortunately, to get to the road less traveled, sometimes we have to painfully compress ourselves into the confines of our own cramped urban sprawl. This trip was different, not only was I going to Alaska to hunt on one of the most remote mountain ranges the Unites States has to offer, but I was going to be hunting one of the most elusive big game species on this continent, the Dall Sheep. Knowing that I wouldn't be seeing more than five people for the next ten days in the middle of endless amounts of untouched wilderness made the confines of modern day flying seem like a very small hurdle. The morning after landing, and meeting up with the rest of our party, we went straight to the train station to start our eight-hour trek north to Denali National Park. Obviously we wouldn't be hunting inside a national park, but the small town of Healy, located just outside the park boundary, is where our guide calls home. Being that this was a "work" trip, the rest of our crew were writers, videographers, and hunting guides. Myself? I'm the Director of Marketing for a sporting firearms company located on the central coast of California called Weatherby. For the last 70 years we have developed and produced what I think are some of the fastest hunting cartridges and most accurate rifles, as well as some fine sporting and home defense shotguns. Personally I grew up in a rural area of eastern Oregon where hunting and shooting wasn't just for sport, but it also got us through some rough winters and provided my family with the lean protein that most people relate expensive weightlifting shakes with. I grew up outdoors and my professional life has also followed that same path. Dustin Lutt, a world-class videographer and photographer for RockHouse Motion. Aaron, managing editor for a major hunting and shooting publication (article to be released soon). Coke Wallace, legendary Alaskan hunting guide and owner of Midnight Sun Safaris. Justin Cox, hunting guide with Midnight Sun Safaris for the last five years. For those of you who are fans of Jon Krakauer, you may recognize the name Healy. Christoper McCandless was found dead just outside of the small town and his memoirs inspired Krakauer's book "Into The Wild" as well as the major motion picture that was directed by Sean Penn. Coke Wallace, the owner of Midnight Sun Safaris, took everyone involved in the motion picture to the bus where McCandless's body was found, only 25 miles from Wallace's house, as well as helping with some of the production of the film. He still takes people on tours out to the remote and barren location. We stayed the first night in Healy at the house of our guide and one of the first things that we noticed was just how long it stayed light. Roughly 21 hours. Knowing that hunting in the lower 48 has a lot to do with cycles and reading the animals' daily activities and trying to get to them based upon their normal daily routines, how do you gauge what an animal is going to be doing when they have 21 hours of daylight in the summer and three hours in the winter? Not to mention we were losing about eight minutes of daylight every single day. It was about to be a crash course in Alaskan hunting techniques. The bush plane flight in to camp was short, about 20 minutes, and as long as you aren't too afraid of flying, it was really smooth. Landing on a bumpy dirt runway that had small bushes and patches of grass all over it however would make even the most seasoned traveller pucker a little bit. Base camp on Moody Creek. The next morning we ate a filling breakfast, packed our horses and started making our way down the valley, all the while glassing for little white specs sprinkled along sheer cliff faces. Within the first couple hours of the hunt we spotted our first group of sheep, and we could tell that they were rams. The problem was that they were just about as geographically far from us as possible. No matter, we had been training for months preparing for exactly an opportunity like this, and we set off to get a better look. The group of sheep spotted above was high up the cliffs on the furthest mountain in this photo. Day one is definitely an exciting time in any hunting season. We look at what we later realize to be monumental or near-impossible feats, and shrug them off. I like to relate it to walking anywhere on the Vegas strip. How many times have you walked out of a casino or hotel on the strip, pointed to your desired destination, and told all your friends that they're pussies for wanting to get a cab? Then about half way there you realize that you're not in a part of town you want to be in (Damn you Stratosphere!). Alaska is a big place and we were just about to teach ourselves a valuable lesson in being prepared for the game that we were chasing. This is where we unpacked from the horses and began our journey on foot. An important lesson about rainbows in Alaska; if you see one and you didn't just get drenched with rain, you're about to. Once we were above the tree line, it was the most beautiful and breathtaking scenery that I have ever seen. At any given time we could pull out our binoculars and witness grizzly bears feeding on blueberries, mountain caribou running aimlessly up and down ridgelines, and dall sheep scaling near vertical rock faces. It really is an unbelievable place. Before we knew it, we had been hiking all day, avoiding ridgelines so we wouldn't skyline ourselves to the sheep we were stalking. Every now and then we would take a break to peak over a ridge to make sure they hadn't wandered off. Everything was going as planned. Most of the hiking was on tundra but the occasional rockslide, sometimes hundreds of vertical feet in size, was not uncommon. This demands boots that are not only very tough but also versatile and comfortable and waterproof. Saving money by purchasing bargain gear is not an option. We finally reached the top at roughly 11pm, and we still had a couple hours of daylight. The only thing left to do was locate the sheep, make sure they hadn't gone far, and plan a stalk. If we didn't have time, we could just wait out the three hours of darkness on the mountain and go after them right at daylight. This plan was not to be. Once we crawled across the tundra up to the top to glass and find out just where the rams may have wandered off to, usually feeding around the cliffs picking at fresh shoots of vegetation. Much to our dismay, they had vanished in the short amount of time that we were in the shadow of a couple small peaks. In the off chance that another group of rams had wandered into the same area, we took a break and glassed hoping to catch of glimpse of white specs. After seeing nothing, we decided to head back down the mountain at midnight. We hit the tree line right at dark, which is really more like twilight, and found the nearest game trail to help with hiking the rest of the way back to the horses. The ability to lift our legs was beginning to get difficult and with the increasing amounts of willows and underbrush that we were stepping over, making our way off the mountain was becoming a safety concern. Coke Wallace, the owner of Midnight Sun Safaris and master Alaskan guide, made the call to get some sleep in a small grove of trees until the light was better. We had been hiking 16 hours at this point. Our campsite on night #1. Our guides got a fire going and we all passed out laying around the fire. The intermittent rain storms throughout the day gave us the choice to either get wet on the outside or put rainwear on that got you wet from the inside while hiking. It was a constant battle of putting layers on and taking layers off. 26 hours after leaving camp for day one, we were back. Day one was complete, nine more to go. The next day we decided to work our way up the valley. Within two hours we had spotted another group of rams, this time much closer and we could tell that at least one was a legal ram. We had a great opportunity to sneak up some deep drainages and get within a few hundred yards and get a better idea of the size and age of all the rams. Within an hour we were in a great spot to watch the rams feed up the rims a little closer to us. We made the decision that Aaron would take the first shot at a legal ram so he got in a prone position and patiently watched the rams work their way within range. It didn't take long for the sheep to get to 375 yards and our guide determined that one of the rams was indeed legal. Aaron was using a Weatherby Mark V Ultra Lightweight chambered in .270 Weatherby Magnum, which means that at that range his bullet would still be carrying more energy than most standard cartridges at the muzzle. Easily enough energy for a humane single shot kill. Aaron's position when he took the shot. Aaron took his time, got his range again, took a deep breath, and squeezed the trigger. It was easy to tell the ram was hit and he fell off the cliff almost instantaneously. (See some of the footage within the video here) Success! Now the real work begins. With all the meat packed up and the cape and head with Aaron, we made our way back down to the horses. As we were getting ready to ride away, Coke leaned over in his saddle, looked at me with a very stern look on his face, and said, "It never happens like that, getting a sheep is never this easy. " Not that I didn't believe him, but the rest of the season served as proof to his statement. For now we were on our way back to camp for hot food and some Twang. Since the location is so remote most of the drinks are powdered to save weight on the trip out. Tang makes the perfect option, and hey, the astronauts drank it so why not. Twang is a concoction that we were introduced to by Justin Cox and it is whatever amount of Tang and whatever amount of booze you care to mix together. It tastes pretty good at the end of a really long day. All the storms at least made for beautiful sunsets. The next couple of days were spent making our way up and down the valley and sometimes getting grounded due to rain and fog. We diligently tried to work around the storms but when the sheep won't move because of the fog, it's really hard for hunters to spot and stalk them. Sometimes you just have to play the hand you're dealt. Horses are the most reliable form of transportation in the backcountry. On the night of day five we decided it was time to go deeper and set up a spike camp the following day. We had seen rams every day up to this point but putting the stalk on them was not always possible. If we could camp where they were, we would have lots more time to stalk, even in between the frequent rainstorms that we had been experiencing. The day that we got to camp will forever be known at Midnight Sun Safaris as "Sheep Aerobics." To be honest, if I was to type out all of the events that happened within the first six hours, I don't think that even I would believe it. I will give a brief rundown of what happened below, to be honest it was so chaotic that no photos or video exists of the events that unfolded. Dustin and I took our horses to a spot and began scanning the rims in the nearby valley looking for potential hunt spots that evening. When Coke and Justin came over to ask how the glassing was going, we got a surprise attack from a ram that came walking over the small peak just behind us. We then decided, since it was a small peak, we would make our way to the top to see where he went. We got about half way up when Dustin spotted four rams coming down the bowl behind us, right toward us. We watched them get within 600 yards then they disappeared so we made our way around the mountain to try to locate them. At that point Coke spotted 9 more rams coming straight toward us on the mountain across from us! By this time, we have no idea what is going on and where all these rams were going. We watched this last group disappear under the hill so we slowly made our way where they had last been seen. Justin belly crawled over to the edge and almost exploded with excitement! All the rams were 40 yards from us! The hillside below us had recently given way and exposed a new mineral lick, where they were all congregated, probably 15-20 rams in all. There were some tense moments where we watched the rams scurry up the hill after smelling us. There were a couple of legal rams but they were very tightly grouped and no shot presented itself. The only thing we could do was watch as they made their way out of range and hope that one of the older rams separated itself from the younger sheep. Unfortunately, that didn't happen. I'm not sure how many miles and vertical feet we covered that afternoon trying to get close to one of the many groups of rams we saw, but we were all exhausted and ready for some Mountain House. The morning of day nine and the urgency of the situation starts to set in. With the frequent storms that we were experiencing, two days could be cut short real easily. It was at that point that Coke pointed out, "I've been in situations like this before and we spotted sheep right from the middle of camp. There's always hope." Within 10 minutes Justin had found one of the groups of sheep, from the center of camp. Immediately we grabbed our gear and set off to make a stalk on them. Putting the Zamberlans through their paces. These boots are made for the most harsh conditions that you can put them through, and your feet will love them. When I showed up at camp one of the other guides had just bought a pair of the same boots and we were both raving about them the entire hunt. The rams began wandering back into one of the large bowls, and Coke and I set off after them. With little to no cover, making a stalk seemed almost impossible. That's when the fog sat in again, only this time we used it to our advantage. When the fog blew in we ran across the shale as quickly as we could knowing that it would only give us a few minutes worth of cover at a time. This happened three or four times until we were finally close enough to notice they were starting to bed down again. We had just enough cover to make our way to a rim rock directly above them. The two legal rams in this group are laying down in the center, the two closest to us. As Coke and I eased our way forward we noticed that the rams were only 40 yards away, staring directly at us! We quickly ducked behind the rocks, Coke instructed me which ram was legal, then I slowly crept forward. As soon as I peaked over the top the rams spooked and ran about 30 yards before turning around to see what we were. I raised my rifle, rolled the safety off, and fired. The 180 grain bullet struck him in the shoulder blade, anchoring him with a fatal blow. The author with his Dall Sheep Ram, after nine long days in the field. Now the hard work begins to break the animal down and pack him out. Everything except bone and unusable internal organs are taken. The heart was eaten the next morning for breakfast, it makes a very good lean protein to start the day. By this time, it was getting late in the afternoon, even by Alaskan standards. We pulled out a backstrap and left the rest up on the mountain for the night. It was cold enough that the meat would be okay and far enough up in the shale bowl that no predators would stumble upon it. We made our way back to camp for a special dinner. Dall sheep backstrap roasted over a campfire on a willow branch. No seasonings, no butter, not even a pan or grill. It was the best steak I've ever had in my life. The hike to pick up the ram the next morning was exciting, and unbelievably exhausting at the same time. The rush of the hunt had subsided and, while still excited about packing out my trophy, the nine days of hunting were starting to take their toll. Walking was like having lead weights tied to my ankles, especially trying to climb the loose shale rock. Luckily we could get the horses within a few miles of the ram so packing him out didn't take long at all. Soon, we were on our way back to base camp, and the ability to completely dry out. The trip home was a blur. Most of us were in and out of consciousness or working on photos and videos all the way to Anchorage. While it was nice to have a regular shower and return to normal sleep patterns, leaving the Alaskan wilderness was hard. It felt natural to wake up and know that all ties to the outside world were cut off. No cell phones. No cars. No waiters or cashiers. For some this would be a nightmare, but for us this was perfection. Every person should take a vacation from civilization and experience what life was like just a couple of short generations ago. Once you step away from everything and harvest your own wild game, nothing will look the same and you will earn a whole new respect for not just the natural world but also our place in it. We as a society are preached to about conservation and how to better utilize our natural resources, what better way to experience how the natural world works than to immerse yourself into it? Photos: Justin Moore and Rockhouse Motion.